Amethistle: Creativity for the Fun of It! : What Do You Mean, "Soak It"? One thing that often happens, especially in the uncontrollable chaos of group tie-dyeing at YMCA family camp, is that someone will carefully tie his or her piece and start dyeing it, then hear me telling someone else to go soak their tied piece in the bucket of soda ash solution. "What do you mean, 'soak it'? I didn't do that..."
Thus begins a process I call a "rescue". The Procion fiber reactive dyes I use need the soda ash to make the color bond to the fibers in the fabric, making the colors permanent. What I usually do for these cases is place the dyed piece in an empty bucket and pour some of the soda ash solution over it (one year a camper dumped her blue piece in the main soda ash bucket on top of other pieces that were soaking. They all got dyed pale blue!) and let it soak. I then have the owner put more dye on to counteract the small amount of washing out that happens when we soak it. This rescue process seems to work well enough, but I was curious as to how much of a difference it really made. So while I was there at camp, I tried an experiment. I tied three identical prewashed cotton bandanas the same way. I soaked one in soda ash, then I dyed all three the same way. The other two were dyed without soda ash. I took one of those two and did a "rescue", pouring soda ash over it and then adding more dye. I then let them sit overnight and washed as usual. So my three bandanas are the "control" (usual process), the "no soda ash", and the "rescue". One initial observation: I generally dislike dyeing dry fabric, with or without soda ash (some people advocate soaking tied items in soda ash, drying them out and then dyeing). Even if the item is prewashed, the dye often beads up, runs off in unwanted directions, or pools up. Once it does soak in, it tends to spread unevenly. With the soda-ash-soaked bandana, the dye goes in smoothly and spreads more evenly, while I have to pretty much force the dye into the two dry bandanas. There was a distinct difference among the three finished bandanas after I washed them out, though not quite as much difference as I expected. In the following picture, the "control" (usual soda ash soaking) sample is on the left, the "rescue" is on the right, and the one in the middle has no soda ash at all. The middle sample is definitely more dull and faded-looking than the other two, especially for the dark cobalt blue triangles on the sides. They are at least a shade lighter than their counterparts on the other bandanas. The "rescue" sample has more vibrant colors than the untreated sample, though it lacks the definition of the "control" sample. I think part of the difference in pattern definition between the rescue and control samples may be due to dyeing on dry fabric--the dye absorption and spreading properties are different. Also, when the dyed "rescue" sample is soaked in soda ash after dyeing, the soda ash solution may be spreading the dye, blurring the whiter areas you see in the "control" sample. The re-dyeing after soaking may also aggravate the blurring. Here is another picture where you can see the differences more directly (click on the picture to see a larger version). 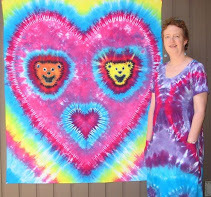 It's clear that the best process for nice sharp tie-dye is to soak the item in soda ash before dyeing it. However, given that mistakes often happen, I think doing the "rescue" process is preferable over just going without the soda ash, so I'll continue to recommend that as necessary. tie-dye washing in the next week or so, so I'll put an update out later. Once again, my dog Lacey, knowing how fabulous she looks on tie-dye, decided to help me out when she saw me getting ready to take tie-dye pictures! That's the "rescue" sample.